Bruno Mars and Kendrick Lamar stole the show, and most of the awards, at the 2018 Grammys. Mars provided the night’s big upset, taking the album of the year trophy that most critics assumed would go to Lamar’s rap tour de force, Damn. In the end, voters found Mars’s crowd-pleasing R&B more palatable, while Lamar dominated the rap categories. Alessia Cara won best new artist – making her the only female artist to win a major prize. Stars like Lady Gaga, Kesha, Lorde and SZA were overlooked, with only 17 awards (out of a total of 86) going to women or female-fronted bands. The imbalance was particularly incongruous on a night that highlighted the #TimesUp and #MeToo campaigns. Most performers arrived for the show wearing a white rose to symbolise their support for the movements, which tackle sexual harassment and inequality. Pop star Kesha also gave a powerful, stirring performance of her single Praying, which addresses her own experience of surviving abuse. She was backed by an all-star choir, including Cyndi Lauper and Camila Cabello, who were dressed in white to reflect the white rose campaign. “We come in peace but we mean business,” said R&B star Janelle Monae, introducing the performance. “To those who would dare try to silence us, we offer two words: Time’s Up. The night’s other pivotal moment was a tribute to the music-loving victims of the tragedies in Manchester and Las Vegas. 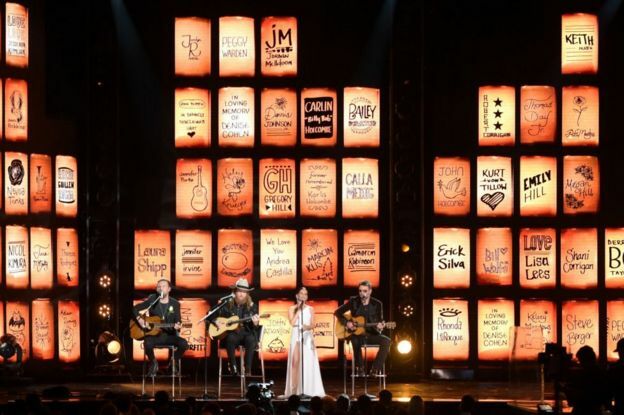 Handwritten notes bearing the names of the dead were projected on the stage as country music stars Maren Morris, Eric Church and Brothers Osborne performed Eric Clapton’s Tears In Heaven. All three acts played at the Route 91 festival last October before a gunman opened fire on the audience, killing 58. “All of country music was reminded in the most tragic way the connection we share with fans and the loving power that music will always provide,” said Eric Church, choking back tears. “We wanted to come together and honour the memory of the beautiful, music-loving souls so cruelly taken from us,” added Morris. Mars left with six trophies in all, including the three biggest prizes: Album of the year, song of the year and record of the year. He also told the story of how, as a 15-year-old in Hawaii, he performed in a show called The Magic of Polynesia, singing songs by R&B writers Babyface, Jam & Lewis and Teddy Riley. 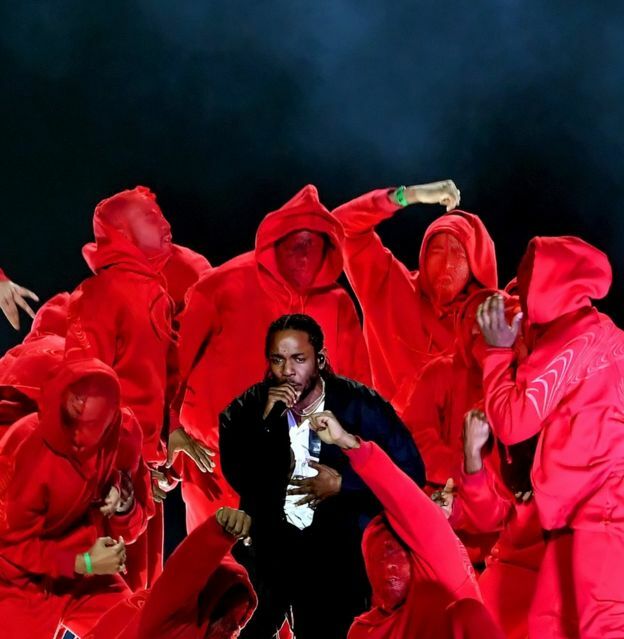 His victory robbed Kendrick Lamar’s more urgent, political album of the night’s main prizes – but the Compton-born star still took home five trophies, including best rap album, best rap song and best rap performance. He also opened the ceremony, in New York’s Madison Square Gardens, with a provocative, politically-charged performance that featured contributions from U2 and Dave Chapelle. “I just wanted to remind the audience that the only thing more frightening than watching a black man be honest in America is being an honest black man in America,” observed Chapelle in the middle of the segment. Lamar’s victories came at the expense of rap veteran Jay-Z and his soul-baring album 4:44. Jay-Z won none of his eight nominations and chose not to perform at the three-hour show. But Lamar tipped his hat to the elder star, declaring “Jay for president!” as he collected the best rap album award. The night also saw performances from Lady Gaga, Sam Smith, Pink and Patti LuPone, who sang Evita’s Don’t Cry For Me Argentina as part of a tribute to Andrew Lloyd Webber. Ed Sheeran, who could not attend the ceremony, won two prizes – best pop vocal performance for Shape Of You and best pop album for Divide. There were also posthumous awards for Leonard Cohen and actress Carrie Fisher, who won best spoken word album for the audio version of her memoirs, The Princess Diarist.